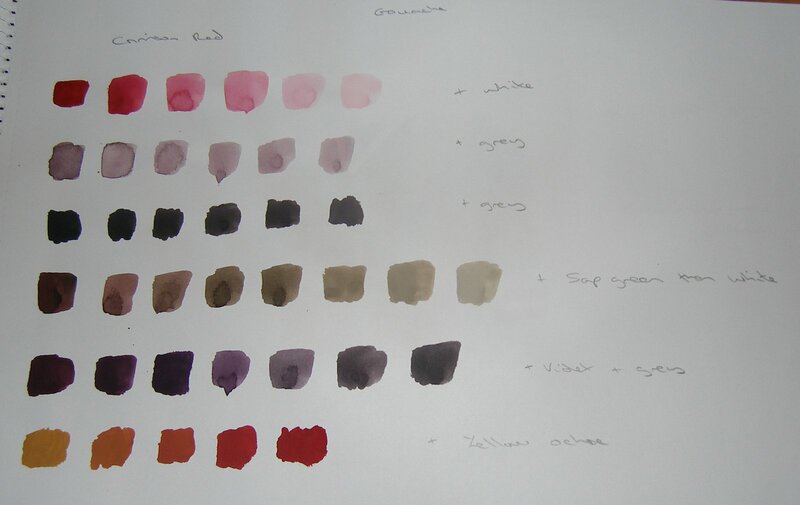 This exercise is all about practising mixing colours and recording them accurately. 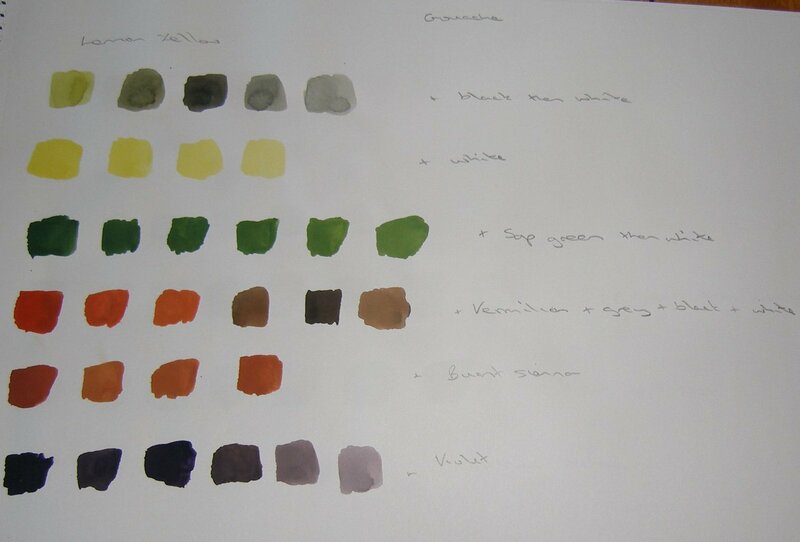 The first part is the practise part, mixing colours with white and black to obtain a range of tints, then mixing complementary colours to produce a range of browns. The first couple of sheets I did using acrylic paints. Then I moved on to using gouache paints, starting with one colour at the top of the page and then seeing what would happen when other colours were added along with white and black. 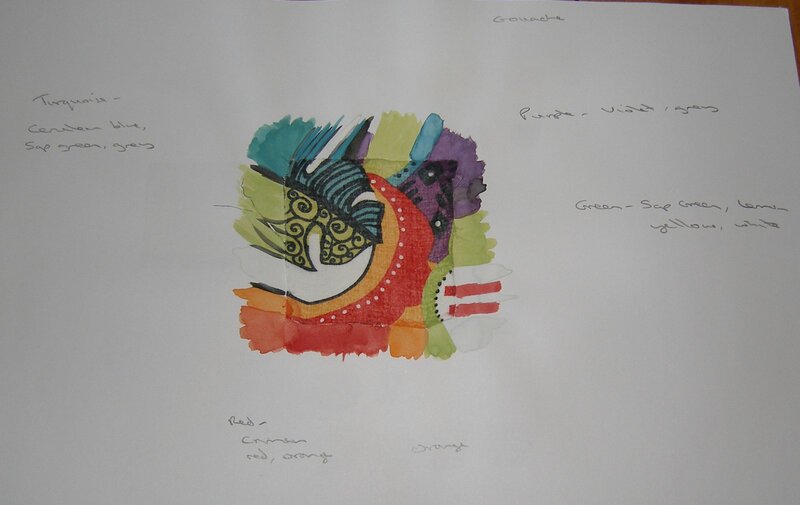 I was very dubious about my ability to do exercise 2 which involves putting a square of patterned material in the centre of a sheet of paper and matching the colours in paint. The idea is so that you cannot tell where the fabric ends and the paint begins. 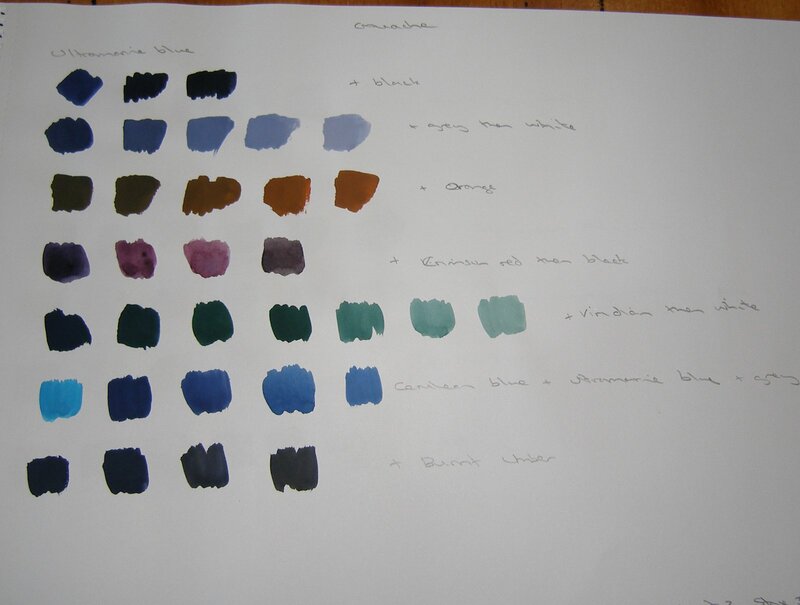 I was quite surprised and pleased that after all the colour mixing practice I had done in exercise 1 I was able to produce fairly good matches of paint to the fabric. The third exercise was very similar to exercise 2, this time matching colours from an image and recording the colours elsewhere on the paper. I picked an image from a magazine with a range of colours in it, made more interesting by the shadows. 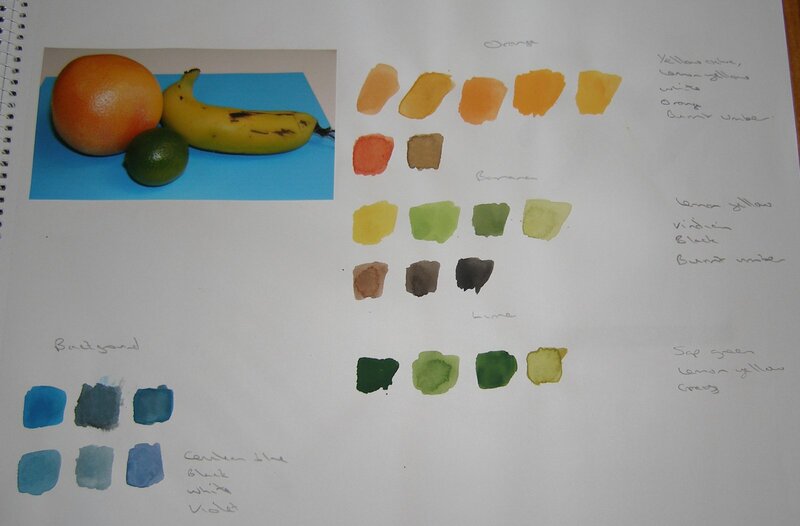 Matching colours from real objects, this exercise is a still life one without actually painting the items themselves! I used fruit which was one of the suggestions in the course notes and tried to recreate the actual colours rather than what my mind expected to see. Again this was made more interesting by the different colours in the shadowed areas as well as on the fruit. 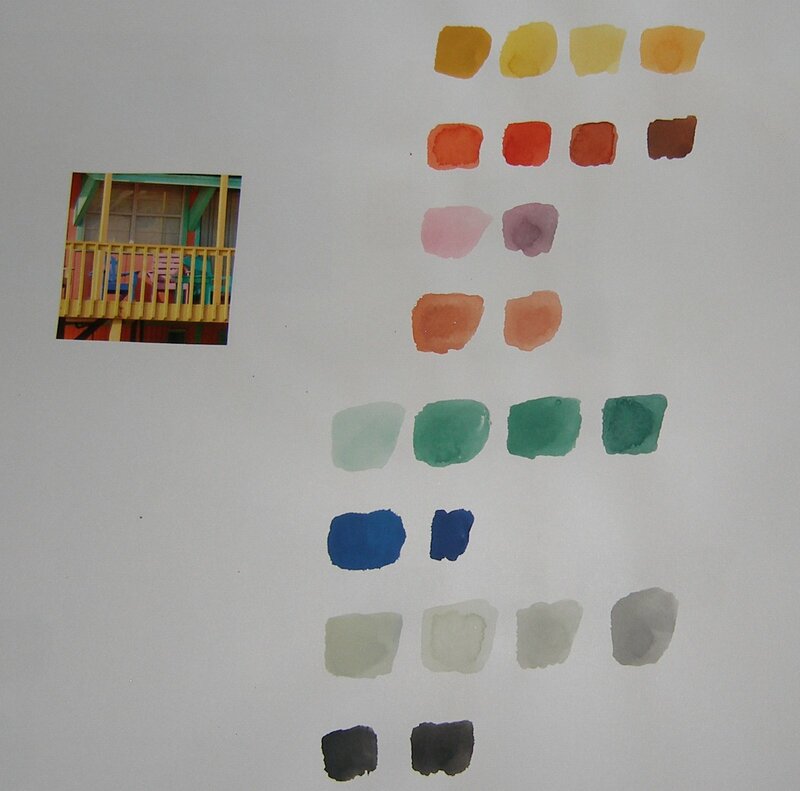 I found these exercises to be really valuable and they have given me more confidence in my ability to mix different paint colours and match those that I see. I was quite surprised with the results I achieved and feel that this has helped my overall understanding of colour theory.